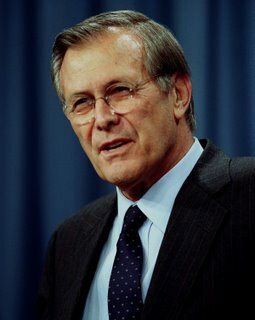 On Election Day afternoon President Bush announced that Defense Secretary Donald Rumsfeld had resigned. What was that all about? Hadn’t the President said continuously and recently that he wanted Mr. Rumsfeld to stay on, that he had confidence in him and that he had done yeoman’s work as Defense Secretary? Yet, on the afternoon that the Democrats scored a take-over of the House of Representatives and the Senate, Mr. Bush announced that Mr. Rumsfeld had resigned, and that Robert Gates will replace him. First, let’s clear up one small issue: Donald Rumsfeld was not fired. Someone is “fired” because they haven’t done a good job, or in some other way have fallen out of favor with the boss. It is clear from President Bush’s comments for the last six years that he was satisfied with Donald Rumsfeld’s job performance. However, one of the many sins of the American media is carelessness with language, or often—and worse--using the most sensational description it can think up. Reporting the “firing” of the Defense Secretary is a better attention getter than reporting what really happened. But what happened was that Mr. Rumsfeld simply stepped aside. How else can you explain that at the same time as his resignation was announced the President also announced who his replacement would be? This decision had been contemplated for quite some time, and it all hinged upon the results of the election. Prior to Election Day Mr. Bush had said that he didn’t agree with the poll numbers indicating big Democrat gains on November 7. He honestly believed that. He also had reacted to the drumbeat from Democrats and even some Republicans that Mr. Rumsfeld should be replaced by defending the Secretary and saying that he wanted Mr. Rumsfeld in office until the end of his term. Mr. Bush knew that if the Democrats gained control of the House that there would be a flurry of investigations that would paralyze the Secretary and the Pentagon. And he also realized that if the Democrats won big his reading of the nation’s sentiment on the Iraq war was wrong; the nation was more upset that he had believed about the progress in Iraq, or the lack thereof. So reality and pragmatism ruled the day, and President Bush relented in the face of a clear message from the voters and accepted the Secretary’s resignation. It may not come as a surprise to you that I am going to defend Donald Rumsfeld. His detractors, Republican and Democrat, ignored some important factors in their haste to condemn his performance. It’s not good enough to say simply that the Iraq war “isn’t going well,” or “is going badly.” To be fair and accurate you have to dig a little deeper and recognize, first, that fighting a war isn’t like building a house: there is no detailed set of plans that if followed will lead to certain victory. All wars are unpredictable; all wars are riddled with errors. But what is more relevant is that this war is unlike any previous war that the U.S. has fought. There is no uniformed enemy representing an identifiable state. The enemy is not like the Redcoat, German or Japanese army, or even like the North Vietnamese forces. It is an ideology, without borders, without a government, without any form at all. We are currently writing the book on how to fight such and enemy, and nobody knows more about that than Donald Rumsfeld, because he is the only one who has done it. Anyone who does not recognize and understand those differences should not be commenting on the war. And anyone who does not acknowledge that those differences are important is not being honest or fair. We don’t yet know whether Mr. Rumsfeld’s tactics were the right ones, and we don’t yet know if anyone can do better.